Surface mount. This changing bed is secured to a steel chassis with concealed, reinforced steel-on-steel hinge. 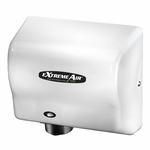 This allows the changing station to hold up to 200 pounds when properly installed. Operates with less that 5 pounds of force (when properly installed). Unit 35" W, 22" H .